There are not many things more satisfying than a plate of golden, crispy skinned chips; doused to taste with salt and vinegar. A fresh salad on a summers day can be extremely pleasant but – when pitted against each other – chips feel so much more comforting for any occasion. Crying alone at home after a stressful day? 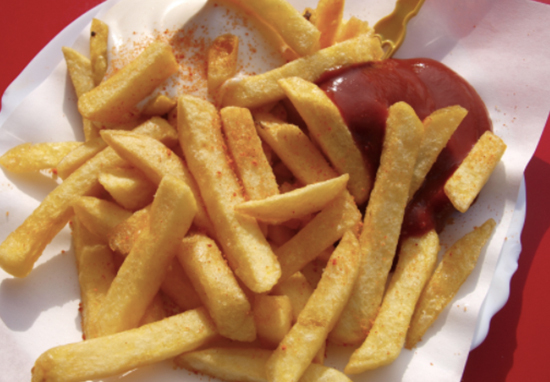 A mountain of ketchup drenched chips will chase your woes away. Having a fun dinner out with friends? Trusty chips are your fail-safe scrummy side dish. Scientists from the Israel based Weizmann Institute examined 800 participants who all ate the very same meal. The rise of blood sugar levels were carefully monitored, as were their physical activity, sleep habits, and bathroom activity. Ahh… Anyways, back to the study. The team of scientists found people’s physical reactions to exactly the same foods were drastically different. A food which could cause a sharp glucose spike for one individual may in fact cause no major or adverse glycemic response for another. One female participant suffered from obesity and pre-diabetes. She had previously attempted to pursue a variety of diets throughout her life, without success. The study showed her blood sugar spiked notably after eating seemingly innocent tomatoes. For other participants, bananas caused greater hikes in blood sugar levels than supposedly naughty cookies. Bananas! The energy packed fruit we are all encouraged to eat even when they go mushy and weird. Great news for all us Cookie Monsters. Most excitingly of all, one person could eat a generous helping of chips and not feel any nasty after-effects whatsoever. Now I’m not saying this an excuse to go for a chippy every night for the rest of the week but I’m also not not saying that. The huge differences that we found in the rise of blood sugar levels among different people who consumed identical meals partly explains why so many diets fail in so many people. Our results point to personalized eating choices being more likely to help people stay healthy than universal dietary advice. Science-driven, personalized diets may enable the integration of nutrition into both healthcare and daily living. This fascinating study could explain why you find it difficult to shed that winter weight while your friend half-arses Slimming World for a week and loses a stone. A one-size-fits-all healthy eating regime all too often doesn’t work, and can even lead you to give up the veggie way altogether in despair. Could this new study help pave the way to a more tailored – and more successful – way of healthy eating?